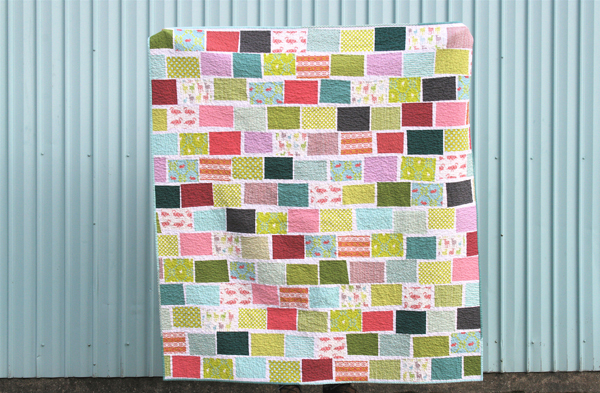 There are many reasons why I love this quilt… Laurie’s gorgeous fabrics, the spring colors, and this fun wonky design! 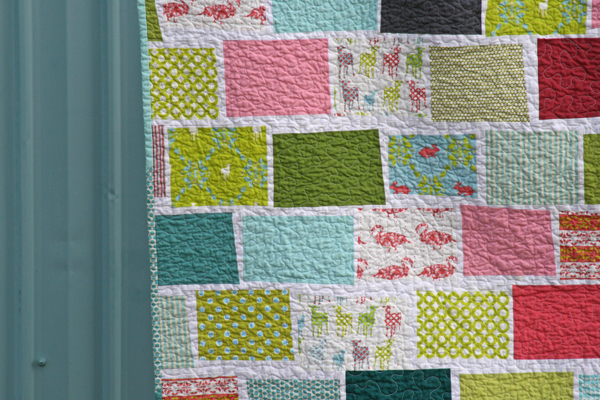 This quilt was inspired by a pillow I saw in a Crate and Barrel magazine a while back. I love the look of the wonky rectangles, but knew that the rectangles on the pillow were appliqued, which is not my forte. So instead I came up with a way to get a similar look without having to applique the rectangles. Thanks so much for stopping by! Have fun browsing all the other fabulous quilts through the festival! The original post about this quilt can be found here. 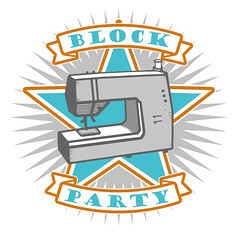 This entry was posted in Posts about Quilts and tagged blogger's quilt festival, handmade, laurie wisbrun, modern, postcards from the park, quilt, quilting, wonky. Bookmark the permalink. I love it! Those fabrics are perfect. Oh! 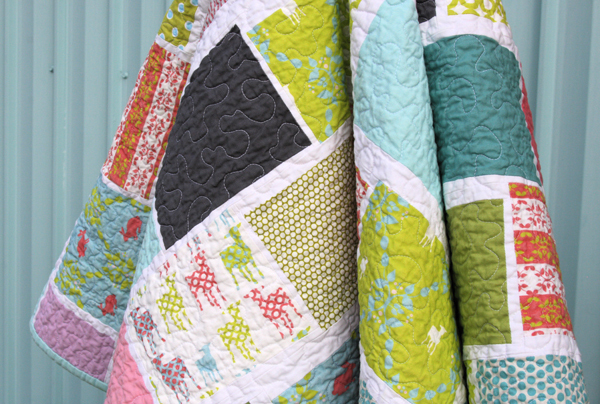 I love, love LOVE this quilt! I’m so gonna make me one! I have been tryingto work out how to do something very similar- glorious, love the subtle wonkiness! I love love this quilt also Ashley! Love it so much I have 3 versions of it planned using an entire yard collection of the original Far Far Away fabrics…all three going to my daughter and two of my nieces that have birthdays in June. Can’t wait! I’m so happy to see you entered this quilt, Ashley! I really love it too. I love the colors and the wonky design with the white sashings in between. I’m not quite comfortable with wonky yet, so I’m happy to hear a pattern is coming cuz I would love to try it. Great job with this one!! Ashley that has always, since it appeared and eclipsed my other favourites, been my favourite quilt of yours, possibly my favourite quilt around in blog and flickr land today. You chose well for the festival! I will look for this pattern on the Kaufman site. I just love the wonkiness! LOVE it!..than again, I think I’m in love with all you quilts….they are all absolutely WONDERFUL…they all have great colors in them! It’s alwasy a joy to see what you have posted! Definitely one of my faves! It must have been hard for you to choose with all of the stunning quilts you make. I love this design and the colours! One of my favs so far – well done! It’s a great combination of colors. I often like the wonky look-especially subtle wonky like this, but have a hard time letting go! I really love that deer fabric! So beautiful ! You have quite a talent for making a design your own. You continue to inspire me, for which I often give you credit, as I did on my festival entry (linked to your flickr group’s quilts). This is another one I’d like to make my own. You have several that are still floating around in my head ! Fabulous! The combination of color and design are amazing. Love, love. I’m so glad you picked this one for the festival – it’s one of my favorites! Love it! I’m thinking “how did you do that?” The blocks of little animals are so cute, too! This is one of my favorites as well. 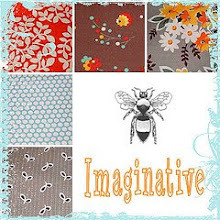 Winning combination of fabric from Laurie, additional colors and design ideas from you. I like your quilt. And your ingenuity. When I saw it I started hearing Pink Floyd’s, ‘Just another brick in the wall”. Dating myself, and I’m not even a big Pink Floyd fan. Say that 3 times fast. Thanks for some more inspiration. Love the timber green version, too. I love this quilt! Well, actually I think I’ve loved every one of your quilts! I’m prety new to the quilting world and it’s great to see some out here that look so beautiful, yet aren’t that far from what I already know. 🙂 – also always such great colors! Is there any way you could do a turorial for this quilt? I’ve been dying to make one, but haven’t quite figured it out. What a perfect post to enter into the festival! Love it! I just can’t seem to make wonky look cool. LOVE IT! AWESOME (as ALWAYS)! I love this one….but then, I love all your quilts! Love it, too. The wonky-ness makes it so special. So pretty, and the colors of the fabrics you chose are to die for! I know why I love that quilt – colors…beautimus. I love this quilt! The colors are so beautiful! love it! the colours, fabric, design! you rock the quilting world ashley!!! This is a great quilt to show of beautiful fabrics. I love it! I saw your quilts over at Kaufman in the two colorways! Fabulous….both Laurie’s fabric and your design. I love this quilt, Ashley! Great design, colors, and Laurie’s fabrics are to die for! I’m just waiting to get my hands on some! Wow! Having something turn out just as you pictured it! What’s THAT like? LOL! Wonderful colors, so cheery and spring like. Thanks for sharing. Such a great quilt! I check your site often and I am always amazed at the cute stuff you make and the amount of quilting you manage to get done! Thanks for sharing your talents with us! I love all your quilts, your work is amazing! You always have something great to show us. Its a great quilt. I’m not a wonky fan, but I really like this! A very effective way to showcase different fabrics. That’s a beautiful quilt! Try as I might, though, I can’t see how you did the blocks. Any chance there’s a tutorial? There are some beautiful quilts at the festival this year, but this is my favorite so far. This is officially on my list of quilts to make. I love the simplicity and the way it shows off the different fabrics. LOVE it! Great design, I love it! I love love love this quilt, I am so thankful it’s going to be a pattern – can’t wait to make it! Love this one. Actually, I’m a fan of all your quilts. I’ve looked at them on Flikr: Fresh Modern Quilts and I like your style. You do great work. Thanks for sharing. I can see why you love this quilt! Great choice, Ashley! My jaw dropped when I saw this one! I’m still baffled as to how you did that without applique!!! Amazing!! It’s just gorgeous! This quilt is so perfectly simple. I love that your rectangles are wonky and not perfect. Love, Love, LOVE IT! Once again you have made a quilt with such wonderful colour. Love how your postcards are wonky. My brain cannot cope with that at all. It is beautiful. I love the wonky blocks. The fabrics are gorgeous too. I just hope you tell us on your blog when the pattern is available ??? Your quilt is a stunner; I absolutely LOVE the fresh, modern, colourful design. I LOVE it! I’ve been a lurker on your blog for about a year now. You always inspire. Sew On! I LOVE this quilt… it’s absolutely stunning! I love the fabrics you chose and the design. Amazing work! Darling, as usual. I love your quilts. You have great vision. The creativity of quilting seems to come so naturally to you. All the geometric designs you use make me wonder if you are a mathematical person. I have only been quilting a few years, and it’s tutorials like yours that have really helped me find “my quilt self”. Love this quilt…it makes me smile just looking at it. You can see my entry HERE. I learned a new term while reading through the comments: “subtle wonkyness”. That’s just what made me fall in love with this quilt, that and the wonderful colours – it just makes me smile! That was a pretty small pile of fabric, but at least it was beautiful fabric!! Hi, I love your blog it is so cute. Congrats on two years and keep up the good work. I would love any one of those beautiful prizes. I really just think this quilt is blowing me away, the thing that amazes me is how you Ladies just do such beautiful machine quilting. I am of the old skill hand quilting and I just can’t seem to get the hang of the machine quilting and I need to because arthritis is preventing me from hand quilting. Just love those colors!! Great design too!! love this quilt–and looked at the other colors and since i love purples that would be my choice, but this is a fun one with the variety of colors. the design is a really neat one and think i might just have to try it once i get a few of the wip’s done! come visit my blog if you have time in betweeen all your beautiful work! !